Our organization is an eminent name, which is engaged in delivering Encoders to the respectable clients. Many applications require a simple, cost effective solution for accurate positioning. 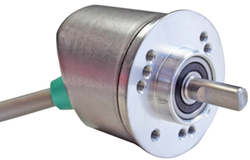 Our Incremental Encoders provide high resolution measurement using an incremental interface. They are available with common configurations such as A, B, Z, and inverted signals available as HTL (Push-Pull) or TTL (RS422). 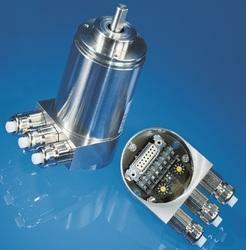 All these Incremental encoders are field Programmable - user can programme PPR / Output Type. In order to append and respond to the diverse demands of clients, we are able to offer Absolute Optical Encoders. The offered range of absolute optical is designed utilizing high grade components at trustworthy associates of the market. In addition to this, the offered products are known for their use in tracking the movements for all positioning tasks in plant and mechanical engineering. Clamp Flange with 40 mm Dia. Clamp Flange with 50 mm Dia. Clamp Flange with 58 mm Dia.